In this post we create a minimal 64-bit Rust kernel for the x86 architecture. We build upon the freestanding Rust binary from the previous post to create a bootable disk image, that prints something to the screen. This blog is openly developed on GitHub. If you have any problems or questions, please open an issue there. You can also leave comments at the bottom. The complete source code for this post can be found in the post-02 branch. When you turn on a computer, it begins executing firmware code that is stored in motherboard ROM. This code performs a power-on self-test, detects available RAM, and pre-initializes the CPU and hardware. Afterwards it looks for a bootable disk and starts booting the operating system kernel. On x86, there are two firmware standards: the “Basic Input/Output System“ (BIOS) and the newer “Unified Extensible Firmware Interface” (UEFI). The BIOS standard is old and outdated, but simple and well-supported on any x86 machine since the 1980s. UEFI, in contrast, is more modern and has much more features, but is more complex to set up (at least in my opinion). Currently, we only provide BIOS support, but support for UEFI is planned, too. If you'd like to help us with this, check out the Github issue. Almost all x86 systems have support for BIOS booting, including newer UEFI-based machines that use an emulated BIOS. This is great, because you can use the same boot logic across all machines from the last centuries. But this wide compatibility is at the same time the biggest disadvantage of BIOS booting, because it means that the CPU is put into a 16-bit compatibility mode called real mode before booting so that archaic bootloaders from the 1980s would still work. When you turn on a computer, it loads the BIOS from some special flash memory located on the motherboard. The BIOS runs self test and initialization routines of the hardware, then it looks for bootable disks. If it finds one, the control is transferred to its bootloader, which is a 512-byte portion of executable code stored at the disk's beginning. Most bootloaders are larger than 512 bytes, so bootloaders are commonly split into a small first stage, which fits into 512 bytes, and a second stage, which is subsequently loaded by the first stage. The bootloader has to determine the location of the kernel image on the disk and load it into memory. It also needs to switch the CPU from the 16-bit real mode first to the 32-bit protected mode, and then to the 64-bit long mode, where 64-bit registers and the complete main memory are available. Its third job is to query certain information (such as a memory map) from the BIOS and pass it to the OS kernel. Writing a bootloader is a bit cumbersome as it requires assembly language and a lot of non insightful steps like “write this magic value to this processor register”. Therefore we don't cover bootloader creation in this post and instead provide a tool named bootimage that automatically prepends a bootloader to your kernel. If you are interested in building your own bootloader: Stay tuned, a set of posts on this topic is already planned! To avoid that every operating system implements its own bootloader, which is only compatible with a single OS, the Free Software Foundation created an open bootloader standard called Multiboot in 1995. The standard defines an interface between the bootloader and operating system, so that any Multiboot compliant bootloader can load any Multiboot compliant operating system. The reference implementation is GNU GRUB, which is the most popular bootloader for Linux systems. They support only the 32-bit protected mode. This means that you still have to do the CPU configuration to switch to the 64-bit long mode. They are designed to make the bootloader simple instead of the kernel. For example, the kernel needs to be linked with an adjusted default page size, because GRUB can't find the Multiboot header otherwise. Another example is that the boot information, which is passed to the kernel, contains lots of architecture dependent structures instead of providing clean abstractions. Both GRUB and the Multiboot standard are only sparsely documented. GRUB needs to be installed on the host system to create a bootable disk image from the kernel file. This makes development on Windows or Mac more difficult. Because of these drawbacks we decided to not use GRUB or the Multiboot standard. However, we plan to add Multiboot support to our bootimage tool, so that it's possible to load your kernel on a GRUB system too. If you're interested in writing a Multiboot compliant kernel, check out the first edition of this blog series. Now that we roughly know how a computer boots, it's time to create our own minimal kernel. Our goal is to create a disk image that prints a “Hello World!” to the screen when booted. For that we build upon the freestanding Rust binary from the previous post. As you may remember, we built the freestanding binary through cargo, but depending on the operating system we needed different entry point names and compile flags. That's because cargo builds for the host system by default, i.e. the system you're running on. This isn't something we want for our kernel, because a kernel that runs on top of e.g. Windows does not make much sense. Instead, we want to compile for a clearly defined target system. Rust has three release channels: stable, beta, and nightly. The Rust Book explains the difference between these channels really well, so take a minute and check it out. For building an operating system we will need some experimental features that are only available on the nightly channel, so we need to install a nightly version of Rust. To manage Rust installations I highly recommend rustup. It allows you to install nightly, beta, and stable compilers side-by-side and makes it easy to update them. With rustup you can use a nightly compiler for the current directory by running rustup override add nightly. Alternatively, you can add a file called rust-toolchain with the content nightly to the project's root directory. You can check that you have a nightly version installed by running rustc --version: The version number should contain -nightly at the end. The nightly compiler allows us to opt-in to various experimental features by using so-called feature flags at the top of our file. For example, we could enable the experimental asm! macro for inline assembly by adding #! [feature(asm)] to the top of our main.rs. Note that such experimental features are completely unstable, which means that future Rust versions might change or remove them without prior warning. For this reason we will only use them if absolutely necessary. Cargo supports different target systems through the --target parameter. The target is described by a so-called target triple, which describes the CPU architecture, the vendor, the operating system, and the ABI. For example, the x86_64-unknown-linux-gnu target triple describes a system with a x86_64 CPU, no clear vendor and a Linux operating system with the GNU ABI. Rust supports many different target triples, including arm-linux-androideabi for Android or wasm32-unknown-unknown for WebAssembly. Most fields are required by LLVM to generate code for that platform. For example, the data-layout field defines the size of various integer, floating point, and pointer types. Then there are fields that Rust uses for conditional compilation, such as target-pointer-width. The third kind of fields define how the crate should be built. For example, the pre-link-args field specifies arguments passed to the linker. Note that we changed the OS in the llvm-target and the os field to none, because we will run on bare metal. Instead of using the platform's default linker (which might not support Linux targets), we use the cross platform LLD linker that is shipped with Rust for linking our kernel. This setting specifies that the target doesn't support stack unwinding on panic, so instead the program should abort directly. This has the same effect as the panic = "abort" option in our Cargo.toml, so we can remove it from there. We're writing a kernel, so we'll need to handle interrupts at some point. To do that safely, we have to disable a certain stack pointer optimization called the “red zone”, because it would cause stack corruptions otherwise. For more information, see our separate post about disabling the red zone. The features field enables/disables target features. We disable the mmx and sse features by prefixing them with a minus and enable the soft-float feature by prefixing it with a plus. Note that there must be no spaces between different flags, otherwise LLVM fails to interpret the features string. The mmx and sse features determine support for Single Instruction Multiple Data (SIMD) instructions, which can often speed up programs significantly. However, using the large SIMD registers in OS kernels leads to performance problems. The reason is that the kernel needs to restore all registers to their original state before continuing an interrupted program. This means that the kernel has to save the complete SIMD state to main memory on each system call or hardware interrupt. Since the SIMD state is very large (512–1600 bytes) and interrupts can occur very often, these additional save/restore operations considerably harm performance. To avoid this, we disable SIMD for our kernel (not for applications running on top!). A problem with disabling SIMD is that floating point operations on x86_64 require SIMD registers by default. To solve this problem, we add the soft-float feature, which emulates all floating point operations through software functions based on normal integers. For more information, see our post on disabling SIMD. Note that the entry point needs to be called _start regardless of your host OS. The Windows and macOS entry points from the previous post should be deleted. It fails! The error tells us that the Rust compiler no longer finds the core or the compiler_builtins library. Both libraries are implicitly linked to all no_std crates. The core library contains basic Rust types such as Result, Option, and iterators, whereas the compiler_builtins library provides various lower level functions expected by LLVM, such as memcpy. The problem is that the core library is distributed together with the Rust compiler as a precompiled library. So it is only valid for supported host triples (e.g., x86_64-unknown-linux-gnu) but not for our custom target. If we want to compile code for other targets, we need to recompile core for these targets first. The command depends on the rust source code, which we can install with rustup component add rust-src. We see that cargo xbuild cross-compiles the core, compiler_builtin, and alloc libraries for our new custom target. Since these libraries use a lot of unstable features internally, this only works with a nightly Rust compiler. Afterwards, cargo xbuild successfully compiles our blog_os crate. Now we are able to build our kernel for a bare metal target. 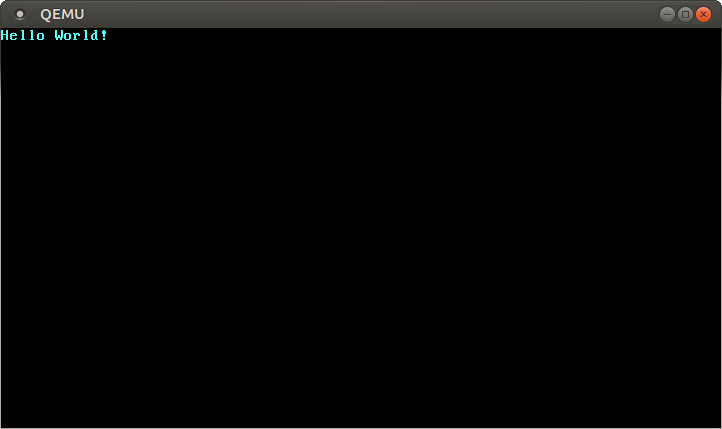 However, our _start entry point, which will be called by the boot loader, is still empty. So let's output something to screen from it. We will discuss the exact layout of the VGA buffer in the next post, where we write a first small driver for it. For printing “Hello World!”, we just need to know that the buffer is located at address 0xb8000 and that each character cell consists of an ASCII byte and a color byte. First, we cast the integer 0xb8000 into a raw pointer. Then we iterate over the bytes of the static HELLO byte string. We use the enumerate method to additionally get a running variable i. In the body of the for loop, we use the offset method to write the string byte and the corresponding color byte (0xb is a light cyan). Note that there's an unsafe block around all memory writes. The reason is that the Rust compiler can't prove that the raw pointers we create are valid. They could point anywhere and lead to data corruption. By putting them into an unsafe block we're basically telling the compiler that we are absolutely sure that the operations are valid. Note that an unsafe block does not turn off Rust's safety checks. It only allows you to do four additional things. I want to emphasize that this is not the way we want to do things in Rust! It's very easy to mess up when working with raw pointers inside unsafe blocks, for example, we could easily write behind the buffer's end if we're not careful. So we want to minimize the use of unsafe as much as possible. Rust gives us the ability to do this by creating safe abstractions. For example, we could create a VGA buffer type that encapsulates all unsafety and ensures that it is impossible to do anything wrong from the outside. This way, we would only need minimal amounts of unsafe and can be sure that we don't violate memory safety. We will create such a safe VGA buffer abstraction in the next post. Now that we have an executable that does something perceptible, it is time to turn it into a bootable disk image. As we learned in the section about booting, we need a bootloader for that, which initializes the CPU and loads our kernel. Adding the bootloader as dependency is not enough to actually create a bootable disk image. The problem is that we need to combine the bootloader with the kernel after it has been compiled, but cargo has no support for additional build steps after successful compilation (see this issue for more information). cargo install bootimage --version "^0.7.1"
The ^0.7.1 is a so-called caret requirement, which means "version 0.7.1 or a later compatible version". So if we find a bug and publish version 0.7.2 or 0.7.3, cargo would automatically use the latest version, as long as it is still a version 0.7.x. However, it wouldn't choose version 0.8.0, because it is not considered as compatible. Note that dependencies in your Cargo.toml are caret requirements by default, so the same rules are applied to our bootloader dependency. For running bootimage and building the bootloader, you need to have the llvm-tools-preview rustup component installed. You can do so by executing rustup component add llvm-tools-preview. We see that the tool recompiles our kernel using cargo xbuild, so it will automatically pick up any changes you make. Afterwards it compiles the bootloader, which might take a while. Like all crate dependencies it is only built once and then cached, so subsequent builds will be much faster. Finally, bootimage combines the bootloader and your kernel to a bootable disk image. After executing the command, you should see a bootable disk image named bootimage-blog_os.bin in your target/x86_64-blog_os/debug directory. You can boot it in a virtual machine or copy it to an USB drive to boot it on real hardware. (Note that this is not a CD image, which have a different format, so burning it to a CD doesn't work). 🔗 How does it work? It compiles our kernel to an ELF file. It compiles the bootloader dependency as a standalone executable. It appends the bytes of the kernel ELF file to the bootloader. When booted, the bootloader reads and parses the appended ELF file. It then maps the program segments to virtual addresses in the page tables, zeroes the .bss section, and sets up a stack. Finally, it reads the entry point address (our _start function) and jumps to it. Now we can omit the --target argument and just run bootimage build. By default it invokes the exact same QEMU command as above. Additional QEMU options can be passed after a --. For example, bootimage run -- --help will show the QEMU help. It's also possible to change the default command through an run-command key in the package.metadata.bootimage table in the Cargo.toml. For more information see the --help output or the Readme file. Where sdX is the device name of your USB stick. Be careful to choose the correct device name, because everything on that device is overwritten. In the next post, we will explore the VGA text buffer in more detail and write a safe interface for it. We will also add support for the println macro.